Print-Quality Images: Upload 2.4 Mega Pixel or better and we retain the print quality size for 3 years from the date of publishing. You must upload images that are at minimum 1920x1280 for Print Quality Downloads to be provided to your clients in the Client Panel. Partial Panorama Detection: if the filename contains fov123x45, we will create a partial pano based on the horizontal FOV (123) and ignore the vertical FOV (45). We will also strip out the fov123x45 from the filename. Partial Panorama Detection: We auto-detect solid black Nadir or Zenith regions, and the camera limits will be set automatically. *For more information on image sizes, click here. 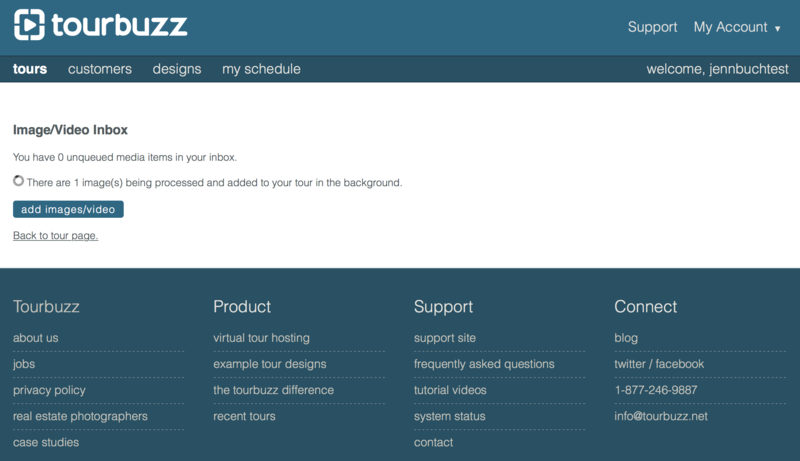 Click on tours under the Tourbuzz Logo and click edit next to your tour. 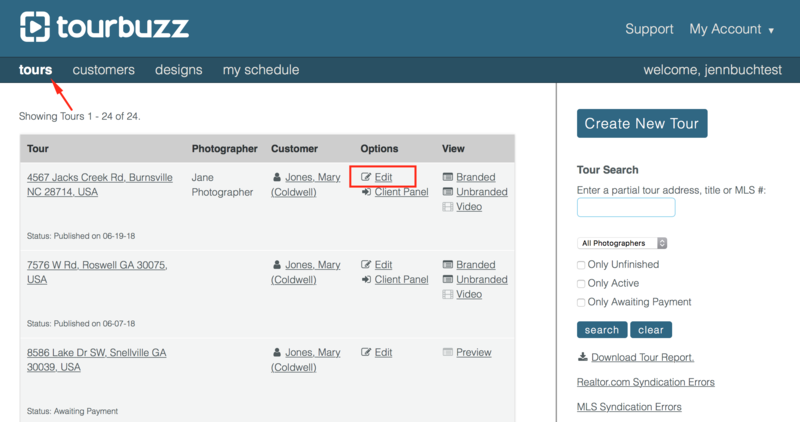 This will take you to the tour editor where you can upload images, customize, preview, and publish your tour. Click on the images/video tab then click add images/video. You are able to add images to your tour at any time, even after the tour has been published. You will be taken to a media upload screen. Here you can add any images / videos / panoramas / floor plans. There are a couple ways you can do this! 1. You can do this by either dragging and dropping your media into the box or clicking on Upload a file and selecting your media. If you choose this method, move on to step 4. 2. You can import your images directly from a third party service (current services available: Dropbox). When you click on Import from a service, select the Dropbox option, and the very first time you'll be prompted to connect to your Dropbox account. From there, you'll be able to select your images, and click "choose." Important: Some browsers may block the Dropbox popup window, requiring you to allow pop-ups to use Dropbox upload. 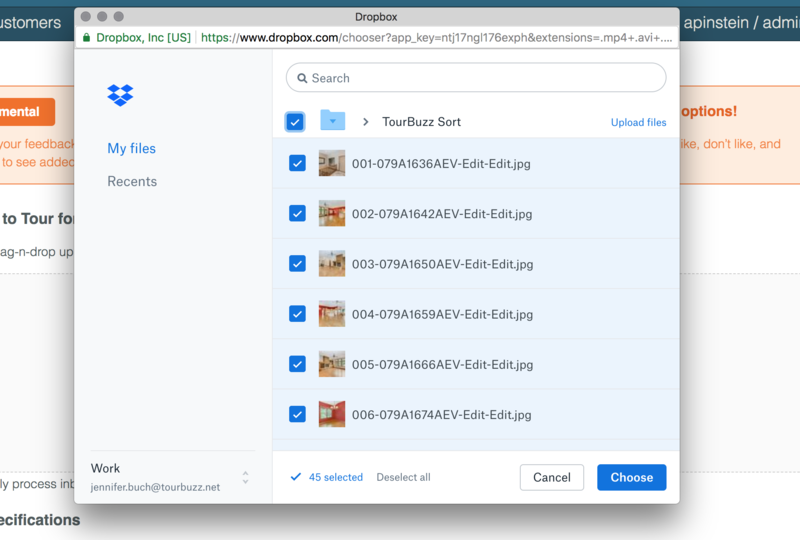 If the Dropbox window does not appear, please check your browser settings and ensure popups are allowed from Tourbuzz, and/or your custom domain. Once selected, the images will automatically begin processing and added to your tour (this integration will also automatically skip steps 4 and 5). 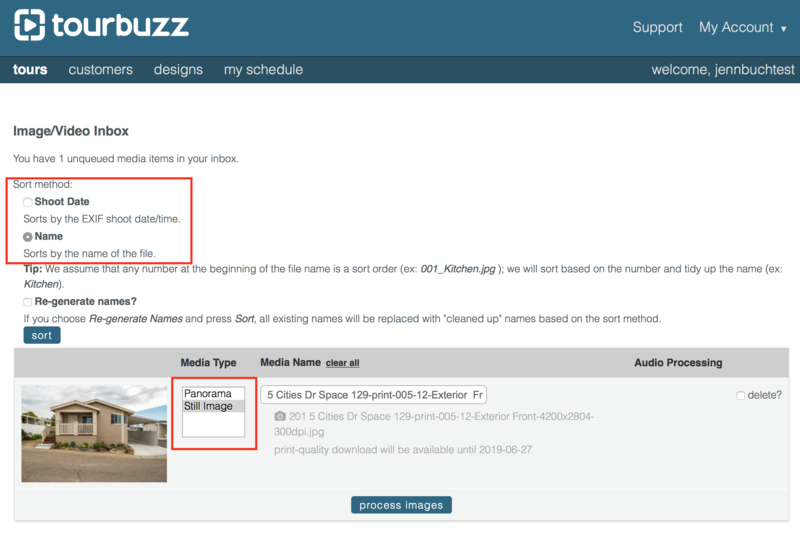 Once you select the images, they will automatically start uploading into Tourbuzz. *Uploading time is based on your internet speed. If your images appear to be stuck uploading, try opening up another browser window and re-uploading your images. Once your images are done uploading you will be taken to the image processing screen. Here you can sort your images by shoot date/name. You also can rename images on this page. After clicking on process images at the bottom of the page, you will be taken to the screen shown below. You can leave this page even if your images are still being processed and return to your tour by clicking on " Back to Tour Page"
Once your images are done processing, you are now ready to preview your tour. You can do so by clicking on either the Preview Tour link located within the Helpful links section of your tour editor OR by clicking on the Tour Links tab and viewing the provided links. You have now finished uploading your images and have previewed your first tour. 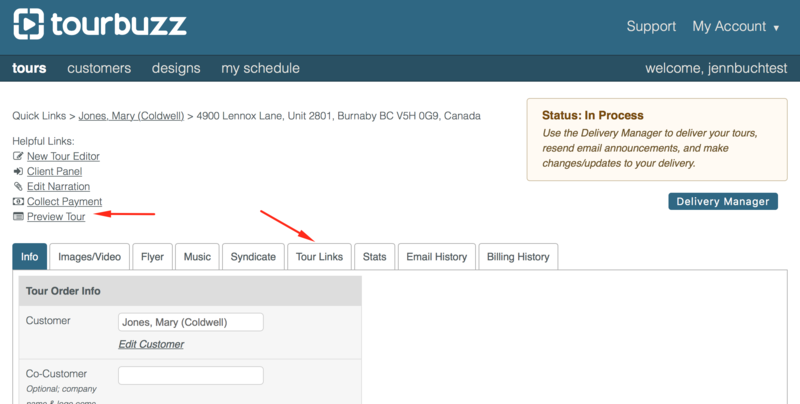 Follow along to step 3 to learn how to make customizations and publish your tour.